UK children watch an average of more than two and a half hours of television a day and spend an hour and 50 minutes online a day, a poll suggests. A survey of 2,445 children aged five to 16 by Child Wise found almost two in three have their own computer (62%). And nearly half have internet access in their own room (46%). The poll suggests two thirds (65%) of children go online most days and collectively children in the UK spent 13 million hours on websites every day. The survey found children regularly use their mobile phones and games consoles to access the internet, giving wider access and personal control. In the five to 16 age bracket, 70% of children have their own mobile phone and this rises to 97% from the age of 11. Among 11-16 year olds, almost two in three are able to access the internet via their phone (65%), and 43% do this regularly. 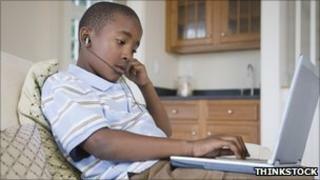 The study also says many children spend time on social networking sites. A third (36%) of seven to 10-year olds visited Facebook in the week before the survey was conducted. For 11 and 12-year-olds this rose to 71% of and to 85% for 13 to 16-year-olds. However, television still had the strongest hold over the children surveyed. These figures suggest the 12 million under 16s in the UK watched 23 million hours of TV a day and 62% have a television in their own room. More than four in five used internet "on demand" television services, with 51% watching via the BBC iPlayer and 36% of younger children (seven to 10) using the CBBC iPlayer. Margaret Morrissey of lobby group Parents Outloud, said children could not be blamed for spending time on the computer or in front of the TV. The creation of new housing estates meant that gardens had been reduced to the size of a "pocket handkerchief", she said. "If we are building houses that are smaller, children are not going to be as physically active. "And it is not really possible in this day and age for them to play out in the street on their own. "We cannot complain as the generation in charge when they (children) use the things we have provided and don't have space to do recreational things outdoors with their parents."